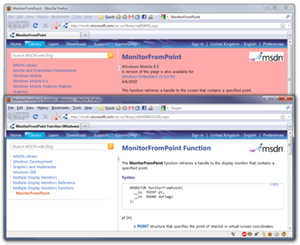 This script is for the Greasemonkey extension for Firefox. 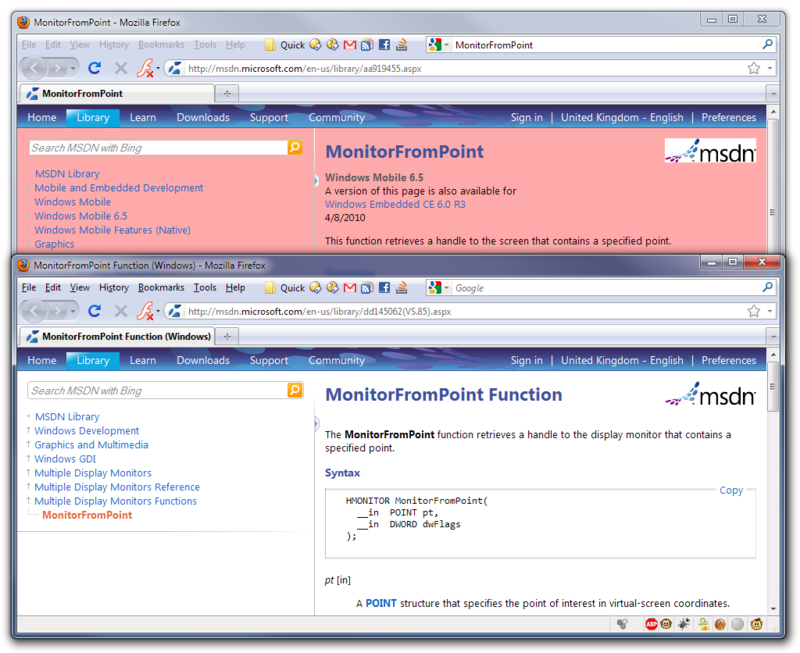 When viewing Windows API documentation on the MSDN website, this script will turn the background red if it detects the documentation is for Windows CE, Windows Mobile or Windows Embedded. I wrote this script after years of frustration caused by web searches for Win32 API documentation (and the craptacularly broken F1 help in Visual Studio) landing me on pages for similar, but slightly different, WinCE APIs with the same names. The default page styles are identical and the APIs are so similar that it's easy to miss that you're on the wrong page. (If you realise at all it's usually after reading most of the page, at which point you have to find and re-read the real API's page in case it's different.) Turning the background red makes it obvious that you've wound up in the wrong place the moment the page loads. I've give up on this script as Microsoft keep changing MSDN in ways which break it and it's too much work trying to keep up.